Since adopting the Complete Streets Policy in 2011, the City of Dunwoody has been very effective into taking account all users of our streets during Public Works projects. We've seen Road Diets on Perimeter Center East (4 lanes reduced to 2, with added Bike Lanes, just for the cost of paint & some signs); Bike lanes appearing magically on North Shallowford with no additional engineering other than re-striping after re-paving; the addition of Bike Lanes and a lovely meandering sidewalks among the trees on a half-mile segment Mt. Vernon (that segment did require widening of the road). And also one of the VERY FIRST projects to add bike lanes was about a mile-long segment on Roberts Drive. The vast majority was from simply re-striping to a 10-ft lane width. Some small segments did require road widening, as well. Since being installed in 2011, it’s so popular with the kids at Austin Elementary that they had to acquire another large capacity bike rack for the kids. Click here for a link to my 2011 story. 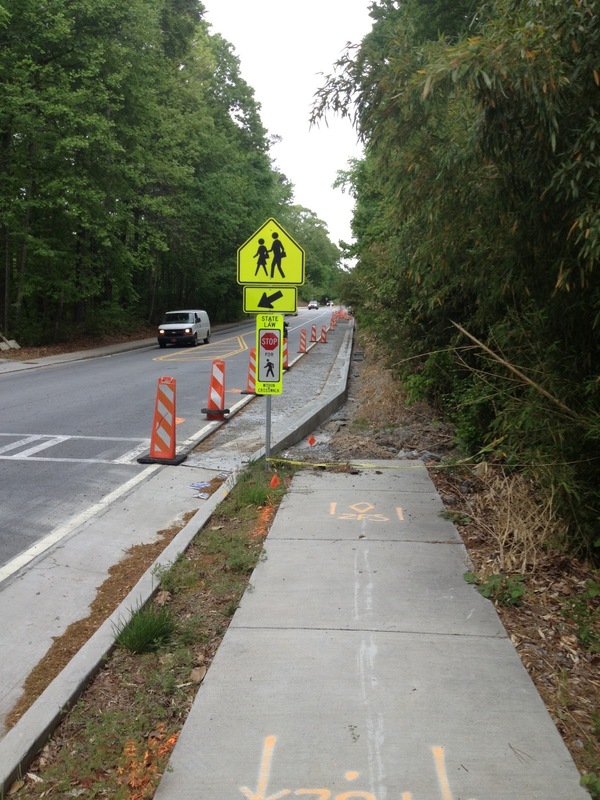 It will indeed be a great day in Dunwoody when all of our K-12 schools have safe infrastructure in place to accommodate both walking and bicycling for our children. On our city's sidewalk plan, there is a prioritization that places emphasis on school connectivity. It's very well-thought out and analytical in nature, removing political influence. 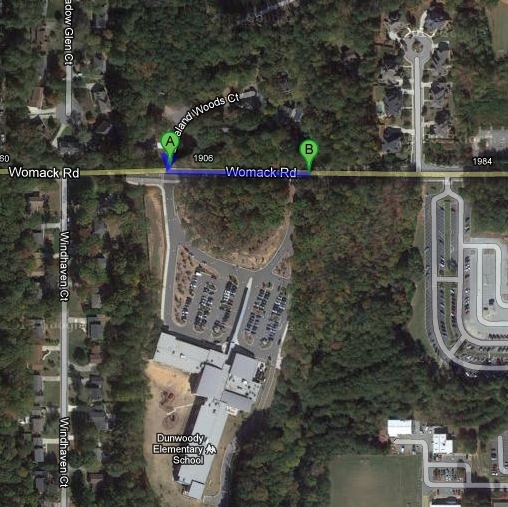 At the present, a sidewalk segment of about 380 feet is being constructed on Womack Drive Westbound, between Oakhurst Walk and Lakeland Woods Court. 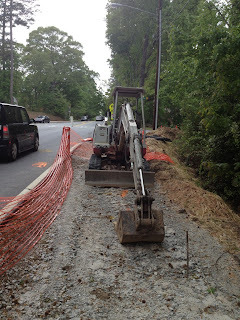 Building this segment will close one of the last gaps directly across from Dunwoody Elementary School, offering neighboring children another safe option to walk to school. I'll defer the discussion of proper school siting and these MEGA-Schools to the experts such as at DeKalb School Watch, Concerned Parents of Dunwoody, and over at Dunwoody Talk. But needless to say, these larger schools do not lend themselves to accommodating safe non-motorized access for children to travel from the adjacent neighborhoods. 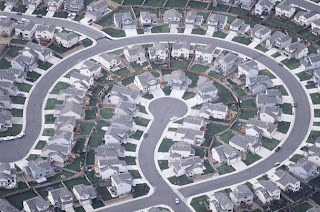 Especially given the combination of greater distances and the plethora of "dead-end cul-de-sacs" that the developers of the 1980's & 1990's were allowed to build. So back to this little segment on Womack. 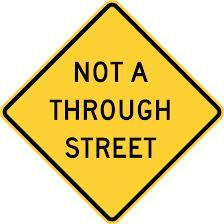 Applying the Complete Streets Policy means taking into account & consideration of all users of our Public Rights of Way. So instead of building the sidewalks along the existing curb & gutter, the city is widening the road over that 380 foot segment, shifting over the curb & gutter and THEN they're going to install the sidewalk. The city did the same thing along a 1/2 mile segment of Mount Vernon in 2012. Why did they do this? To provide for future accommodation for a bike lane. Just like on Roberts Drive. When the rest of Womack is resurfaced, and/or there's new development taking place (see Berman Commons), they'll be able to add bike lanes. Much of it can be accommodated through re-striping to a 10-ft travel lane width. What does this accomplish for Womack Road, it's neighbors and it's users? #1: Traffic Calming. Decreasing lane widths to 10-ft is proven to slow traffic. More bicyclists out on the road will also calm traffic. #2: Gets the "interested but concerned" folks out there for a bike ride. I'm talking about the opposite of the Lance Armstrong wannabes that ride with the Dunwoody Cycling club every Saturday morning at 7:30 am DHS, or from Mellow Mushroom on Tuesday nights at 6:30 pm, etc. Maybe these casual users will consider heading out & venturing around beyond their immediate neighborhoods. The more people out on bikes, the safer it is for all. Car drivers (just about all of us) become accustomed to seeing people on bikes. That raises their awareness. #3: Continues to build out the network to CONNECT to places. Georgia Perimeter College is on this road. Headed in the opposite direction is Dunwoody Village. Take some back roads & end up at Brook Run Park. The list goes on. #4: Increases Property Values. Millennials want walkability & bikeability. They want to go places without needing to get in a car. #5: Makes for a Healthier Community: Retirees move to places like Carey, NC for their amenities including multi-use trails, bike networks and pedestrian access. For several years it's been listed as Money Magazine's one of the best places to live. ... AND, they have received national recognition as a Bicycle Friendly Community since 2003. In my heart at the end of the day, it's really not about bicycling. Rather, it's about a sense of community and sharing with the freedom that occurs once we step outside of those metal-framed glass enclosed boxes on wheels. It comes from encountering people in the sunshine face-to-face, smiling, waving and simply saying hello. I stand corrected with a detail: There had not been a curb & gutter at this location. To install a sidewalk, the city needed to add the curb & gutter.